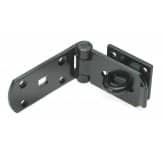 Black Heavy Duty Hasp & Staple 200mm A tough hardened steel plated hasp and staple designed to last. For use on sheds and gates. In a Black finish for extra and durability, 200mm long.